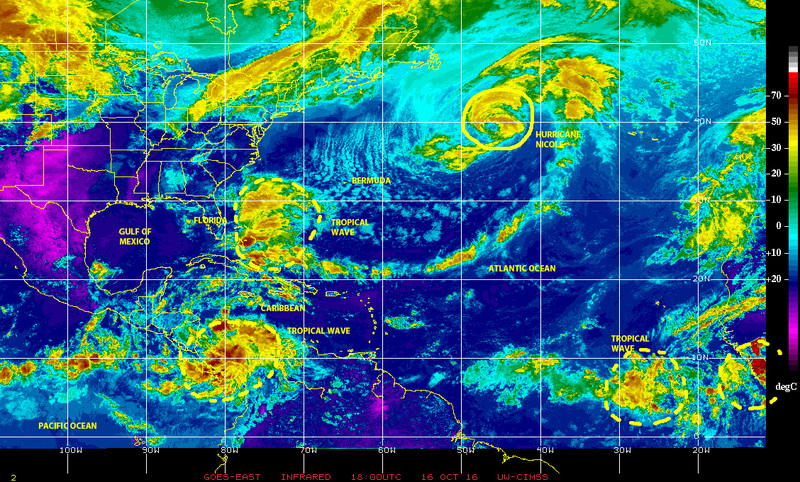 16 October 2016: The northern tropics remain restless, watch out! The Autumn equinox in the northern hemisphere has come and gone, and as the Sun marches south of the equator overhead the southern hemisphere tropics we have started to see tropical waves and storm cells flare-up on that half of the planet. Soon the northern hemisphere hurricane, typhoon and cyclone seasons will start to wind down and cease menacing hundreds of million of residents of coastal regions and island nations in the Atlantic, the Pacific and the Indian oceans. We in the northern hemisphere must however remain alert and be prepared, for the ‘official’ tropical cyclone seasons may end on fixed dates, but the reality is that Mother Nature will always do as she will! Also, ocean heat content has continuously grown higher as every new year becomes the warmest of record or one of the warmest. So, conditions for tropical cyclone development have become earlier-happening, longer-lasting and wider-spread over time. In fact, satellite imagery this morning brought pictures of a large tropical disturbance over the Bahamas looking suspiciously as if cyclonic development could be possible. This may already be affecting a wide region from Florida to the Carolinas, which were hit hard a few days ago by Hurricane MATTHEW, and also suffered a remote hit that coincided with King Tides from passage of Hurricane NICOLE at a distance. Other satellite images of the north Atlantic basin show a tropical wave over the isthmus of Panama, another one in the middle of ‘hurricane alley’ and yet another one beginning to emerge over the eastern Atlantic from equatorial Africa, plus a nice one of Hurricane NICOLE still going strong over the open waters of the Atlantic. Farther east from the eastern Atlantic waters, there remains a long train of tropical waves and storm cells over equatorial Africa reaching all the way to Lake Victoria and beyond. Plenty of fuel left for future cyclonic activity. Enhanced infrared satellite image of 16 October 2016 over the Northwest Pacific showing typhoons SARIKA and HAIMA respectfully moving away from and approaching the Philippines! 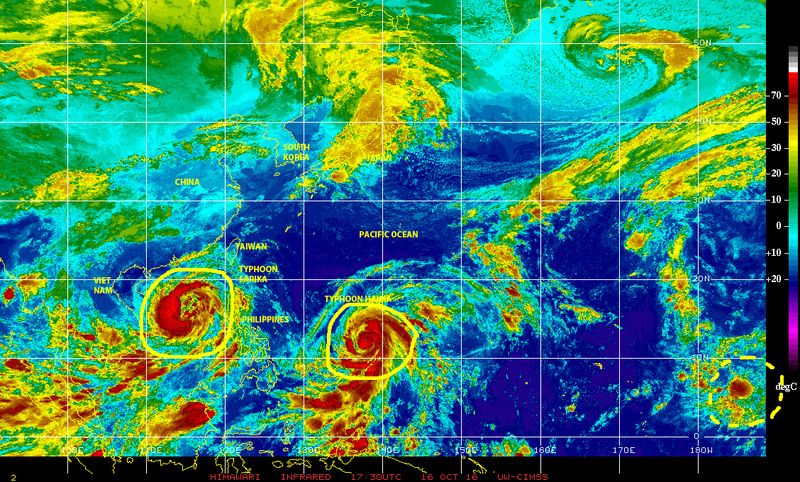 On the opposite side of the planet, near northwest Pacific waters there is typhoon SARIKA moving in the South China Sea toward another landwall after ravaging the Philippines, while to the east there is a strong typhoon HAIMA approaching the Philippines Sea and a possible double-whammy on that most cyclone-vulnerable country on Earth. Life goes on, and this is the only planet we have for now, so it is prudent to pay attention, remain alert, and be prepared alway. MITIGATE!